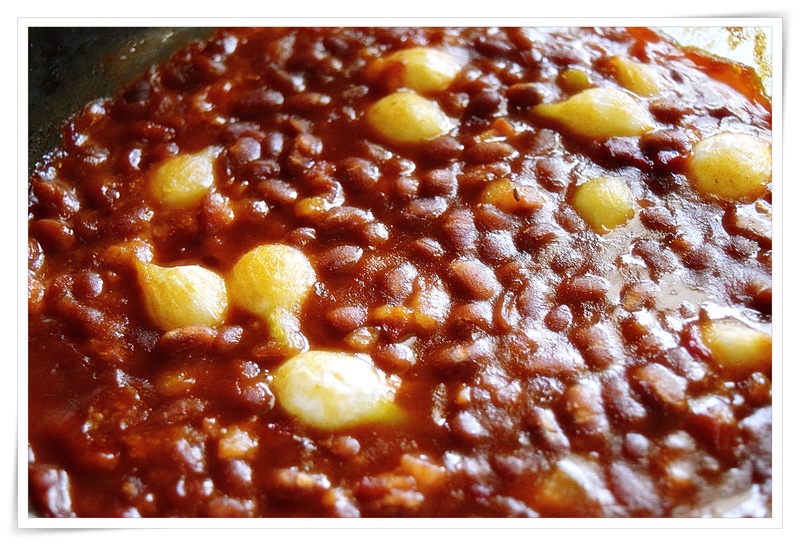 Just in time for Labor Day weekend baked beans to go with any number of grilled foods…this week at the cooking club theme potluck dishes and my contribution is the baked beans that I made for “Pub Eats” and never posted the recipe from Hugh Fearnley Whittingstall. We had the beans with the Bloody Mary burgers, but I’m thinking of having them again with BBQ chicken or baby back ribs. A great make ahead dish and it looks like we might have one or two rainy days perfect weather for slow baking beans indoors. Soak the beans overnight in plenty of fresh cold water or the quick soak method also works. Drain and rinse, then put in a heavy casserole, with fresh water to cover the beans by about 2 inches. Bring to the boil and boil hard for at least 10 minutes. Lower the heat to get a gentle simmer, cover with lid, and simmer for about one hour until the beans are tender but not completely soft. Remove from the heat. Cut the pork belly or pancetta in large 2-inch cubes, leaving the rind on and add to the beans. Stir in the brown sugar, molasses, and mustard. Place the lid on the casserole. Bake the beans in the oven for about three hours. Remove the lid and dragging some of the pork chunks to the top. Return, uncovered, to the oven, for a further hour. Season, to taste, with salt and freshly ground black pepper.